Unfortunately, walkways are not always given the attention they deserve. 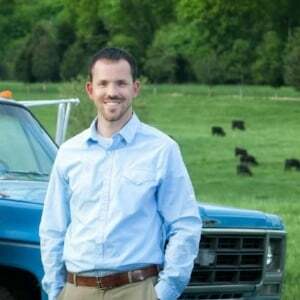 For some landscape companies, they’re even an afterthought. They may be slapped together at the last minute without any real thought given to how they flow with the rest of the property. We’ve also seen homeowners get beautiful renovation work done on their property but leave the existing walkways untouched. This ends up detracting from the overall beauty. It simply doesn’t make sense to have a beautiful outdoor space such as a patio or an outdoor kitchen with a dinky walkway leading up to it. We believe that walkways hold a lot of value. That’s why we’ve rounded up some of our best stone walkway ideas and tips to get you started in the process. As mentioned, walkways are not always given a lot of attention. They seem like one small piece of an overall design and so they become an afterthought. But the truth is that walkways hold a lot of value as well as a lot of power. For instance, they can control the flow of traffic around your property. If you don’t want guests passing through a certain area of the backyard, you can direct the way they’ll move about with the most desirable stone walkway design for your property. The direction and the flow are just two of many important design facets of a walkway. Here are some other stone walkway ideas to consider as you create the design that is right for you. When it comes to the material used for your walkway, we suggest natural stone which will hold up best to the wear and tear that the walkway will receive. It also looks the best. You just want to make sure that you choose something that complements the house, which we’ll address next. You want your walkway to relate to the surrounding architecture—namely, the house itself. If it doesn’t “fit in” with the surrounding architecture it’s going to stick out like a sore thumb. While you want your walkway to be beautiful you also don’t want it to stick out. It should blend with its surroundings in a complementary fashion. We have found that Pennsylvania flagstone or bluestone both work well for the Colonial homes that we commonly see around Northern Virginia. If you live in a more modern style home, you might still choose another natural stone option but in a color or texture that is more streamlined in its look (as flagstone often has a multi-color tone to it). It’s important to find a material and a color that is complementary when creating your stone walkway design. You want to make your walkway at least four feet wide. This allows two adults to comfortably walk side-by-side without jockeying for a position or having to walk single file as though they were back in elementary school. Five feet wide is even better. 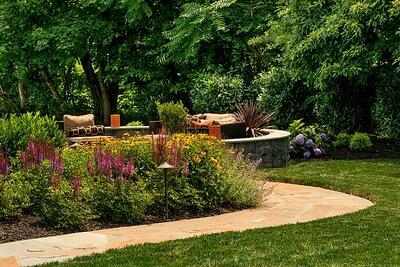 It creates a comfortable amount of space for guests to traverse the path. Angles are also very important when it comes to the layout of your walkway. You don’t want 90-degree angles because nobody walks perpendicular. If your design is laid out this way, people are going to just cut corners and go through your grass. You want rounded corners, but you also don’t want to make a windy path that unnecessarily leads people out of their way. We’ve seen some walkways designed in an “S” shape, perhaps to create some interest, but it often leads to people finding a short cut. When speaking of the front yard, you want to make the path from the driveway as easy as possible so that they don’t even have to think about it. It’s just natural for guests to follow the flow of the path rather than choose their own short cut. One thing that we always like to incorporate in our stone walkway designs is what we call a “handshake area.” This would be a larger space near the entrance of the house. As people leave your home you don’t want them teetering on the edge of the stoop. Without a larger space incorporated into your walkway, this area can also create a bottleneck as people come and go. But if you make it wide enough, then it’s a comfortable space to greet people as they arrive and to say goodbye as they leave. We’ve done the handshake area as a circle. We’ve also done larger square handshake areas, perhaps with a decorative border to delineate its edges. 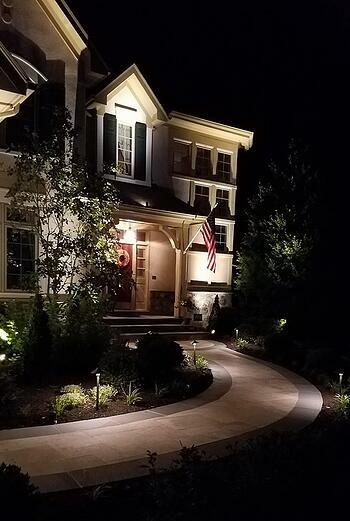 Landscape lighting is also an incredibly important part of your stone walkway design. There are many different options out there but the key is not to draw an excessive amount of attention to the path lights. You want them to serve their purpose of making the path easier to navigate but you don’t want the lights to stand out. One mistake we commonly see is when homeowners use way too many lights. You don’t want to make your walkway look like an airport runway. You probably already know that natural stone is going to cost more than pavers, after all, it’s a better product. But we’re not building the Taj Mahal, we’re building a walkway, so the truth is it’s not that much more. Typically, natural stone is about 25 percent more expensive. If it were a larger project it might seem more costly but a walkway is small enough that the difference isn’t going to feel that extreme, particularly when you consider the value you’re getting. What we tell customers is that with something that’s getting as much traffic as a walkway, it’s worth the splurge for natural stone. It’s going to hold up a lot better and it’s going to continue to look nice for years to come. It also has a better return on investment. If you do go to sell your home in the future and you have a natural stone walkway, that’s going to get you a lot more interest. 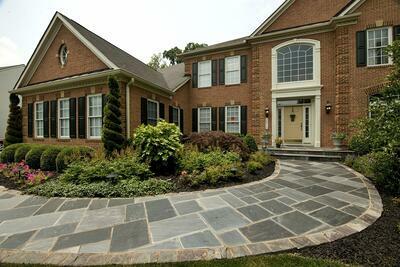 Curb appeal, in general, is crucial in resale value and a natural stone walkway does a lot to boost it. In the long run, we feel that natural stone is also the more cost effective option. Pavers will require a lot more maintenance over the years. In the end, you’ll wind up paying more for pavers (if you factor in all the maintenance) than you would have for investing natural stone. When looking for stone walkway contractors, we suggest finding a company that has some nice stone walkway designs that they can show off in their portfolio. You don’t want to wind up with a company that thinks of walkways as an afterthought and just slaps something together. The key is to find a company who looks at them as an integral part of the overall design. That is a company that cares about every detail of the project from the patio to the walkway. No details are ultimately small details when you want a complete, finished space. It’s also important that you find a company that is comfortable working with natural stone. 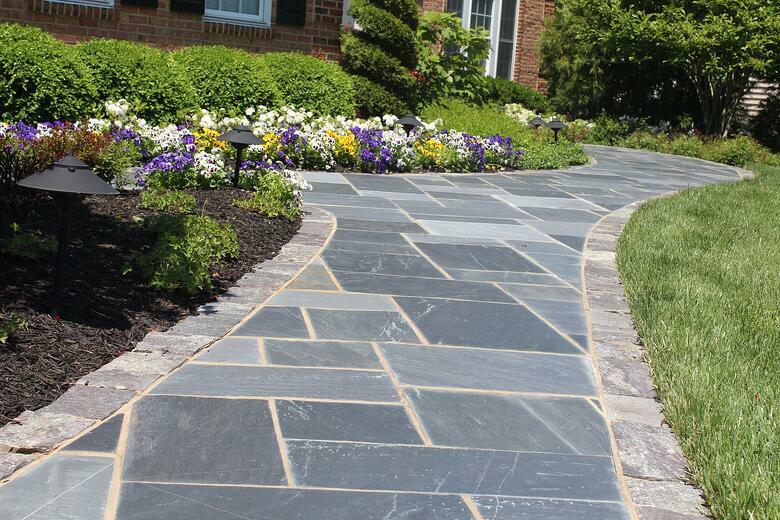 There are a lot of walkway companies in Ashburn, Aldie, or Leesburg, VA, but the majority of them work with pavers. It takes extra skill to know how to work with natural stone, which doesn’t just fit together like a lego kit or a puzzle, as pavers do. We also see a fair amount of homeowners that try to tackle the walkway on their own. People tend to underestimate the amount of work that’s involved with renovating a walkway. But it’s easy to get over your head. Say you have an existing concrete walkway in your front yard. It’s relatively small and it seems easy enough to replace on your own. But just getting the proper rental equipment to remove that walkway and doing it the right way winds up being a lot more time and money than you might realize. You’ll likely need the rental equipment for multiple days, maybe several weekends—and that’s just getting rid of the walkway you don’t want. Installing the new one is a whole other project. There’s often more to it than people realize. 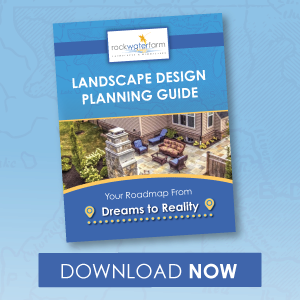 If you’re thinking about a new walkway for your home, we’d love for you to consider Rock Water Farm. We have extensive hardscaping and masonry experience and can ensure that the finished product suits your exact needs. 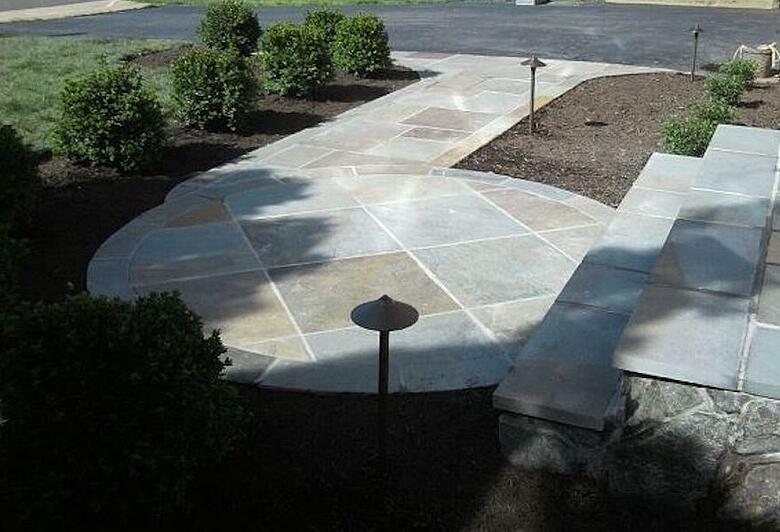 We also have many stone walkway ideas for you to peruse in our portfolio to give you more ideas for your own project. At Rock Water Farm, we’ll help you to determine what style and layout might look best for your Northern Virginia home. Every project is different and we take a custom approach every single time. This gives you a finished product that not only boosts curb appeal but is also highly functional for your needs. 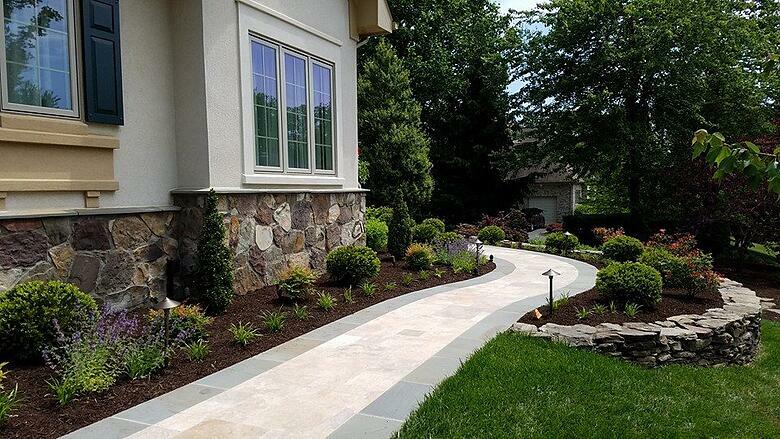 To get started on your walkway project for your Ashburn, Aldie, or Leesburg, VA home, contact us for a free consultation or give us a call at 703-327-1636 so we can answer your questions.